The first line of Gertrude Stein’s “Susie Asado” is made of three consonants and one vowel sound: “Sweet sweet sweet sweet sweet tea.” The musical phrase to which Virgil Thomson set this line in 1926, thirteen years after Stein wrote it, consists of two notes, C and E flat: after five terse repetitions of the word “sweet” on C, the singer jumps up a minor third to E flat on “tea.” Then the piano enters with a C minor triad. As the song continues, Thomson’s commitment to the simplest harmonic vocabulary hardly wavers: the C minor triad is followed by a C minor scale, played in parallel sevenths, and from then on the accompaniment alternates between triads and scales. Stein’s readers have long debated the meaning of “Susie Asado,” but Thomson admitted that he was attracted to Stein’s writing precisely because he didn’t know what it meant. Treating the text as pure sound, Thomson makes it feel paradoxically more purposeful, more meaningful in the musical setting than it feels on the page. As Aaron Copland said of Stein and Thomson’s celebrated opera Four Saints in Three Acts (1934), Thomson’s music “draws a frame” around Stein’s language, the frame consisting of egregiously basic musical gestures. Since the Renaissance, triads and scales have been the basic building blocks of tonal music—music we can describe as being in a key, such as C minor. When early-twentieth-century composers like Arnold Schoenberg set out to write music not in a key, allowing us to experience dissonance as something that wouldn’t require resolution, the basic building blocks of tonal music needed to be shunned. But while Thomson foregrounds triads and scales relentlessly in “Susie Asado,” as if to suggest a rousing reinvigoration of tonal practice, his repetition of these building blocks never establishes a strong sense of a key; because there’s nothing in tension with them, there’s nothing at stake in returning to them. Like other American artists who embraced a disarming simplicity of means (such as Stein), Thomson made familiar artistic gestures seem provocatively strange, and it’s misleading to think of him as someone who reacted against the groundbreaking complexities of musical modernism. Thomson was investigating the range of possibilities inherent in his medium—the medium being, in this case, the notes of the diatonic scale. For a long time that was hard for some people to hear. Compared with T.S. Eliot’s poems, which foreground their learned complexities, Stein could seem uninvolved in the great dilemmas of modern culture, and Thomson’s music could seem similarly to shun the big questions. The philosopher Theodor Adorno championed Schoenberg’s music because of “the expression of suffering and the pleasure taken in dissonance,” a pleasure that was “inextricably interwoven in authentic works of art in the modern age.” By this standard, even Igor Stravinsky, whom Adorno dismissed as “the yea-sayer of music,” seemed insufficiently serious. In such a climate of taste, a climate that equated anxiety and complexity with authenticity, Thomson’s music was doomed to seem quaint. With the rise in the 1960s of the musical minimalism associated with composers such as Steve Reich, Thomson began to seem more hip. But this version of postmodernism already appears as blinkered as Adorno’s polemical modernism, as Thomson’s best music does not. Throughout The State of Music Thomson stresses that artists are members of a profession: they acquire training, they practice their skills, they get paid. There’s nothing dreary about this demystifying perspective, however, for Thomson is throughout The State of Music a beguilingly deadpan manipulator of his medium—the medium being, in this case, not the notes of the scale but the syntax and diction of the English language. That music is an island, like Ceylon or Tahiti, or perhaps even more like England, which Bossuet called “the most famous island in the world.” That the waters around it are teeming with digestible fish that travel in schools and are known as painters. That swimming around among these at high speed and spouting as they go are prehistoric monsters called poets, who terrify all living things, fish and islanders alike. That these monsters are quite tame, however, in spite of their furious airs, and that since they have no industrial value just now, and since their presence offers no real danger to musical life or to the fishing industry (for they attack only one another), they are allowed to survive and are occasionally given food. Indeed, their evolutions offer a spectacle that is considered by the islanders to be not only picturesque but salutary, instructive, and grand. Behind these metaphors lies Thomson’s hard-won intimacy with both musical and literary mediums: to learn about counterpoint and harmony, you need to study with someone who is conversant with the composition of music; but to learn about diction and syntax, you don’t need necessarily to study with a poet, which is why people who happily send their kids to piano lessons may wonder if poetry can be taught at all. Now that the proliferation of MFA programs in poetry has coincided with the decline of print culture, poets may seem more than ever like harmless prehistoric monsters. Musicians seem more obviously to be members of a profession. Because an aspiring composer needs to be in close contact with practicing experts, Thomson reasoned, most music is written in great centers of musical activity, while painting and poetry may flourish in isolation. By the same reasoning, a “collaborative” art such as music or theater requires the response of critics as “solitary” arts such as painting and poetry may not: “It used to amuse me in Spain that it should take three children to play bull-fight. One plays bull and another plays toreador, while the third stands on the side-lines and cries ‘olé!’ Music is like that. It takes three people to make music properly, one man to write it, another to play it, and a third to criticize it. Anything else is just a rehearsal.” Criticism of the solitary arts is of course possible, but Thomson believed that in the collaborative arts, criticism is part of the process. After publishing The State of Music, Thomson accepted an invitation to become the chief music critic at the New York Herald Tribune, a position he would hold for the next fourteen years. During his lifetime, he collected his reviews and articles in four subsequent books (The Musical Scene, The Art of Judging Music, Music Right and Left and Music Reviewed), and now the meticulously edited and beautifully produced Music Chronicles 1940–1954 gathers these books, along with a number of uncollected reviews and an uncommonly readable apparatus of textual and explanatory notes. That this 1,177-page volume does not include The State of Music, Thomson’s most gratifying prose performance, is much to be lamented. It was in this book that Thomson worked out his characteristic way of thinking, which is to say that he established himself there as a distinctive prose stylist; every page in Music Chronicles rests on that achievement. Virgil Garnett Gaines Thomson was born in Kansas City, Missouri, in 1896 to staunchly Baptist parents. Like lots of kids, he received piano lessons, but unlike most kids he was lucky enough to have his musical gifts recognized by a series of dedicated teachers, and by the age of 15 he was working as a piano accompanist and church organist. After graduating from high school, the 130-pound Thomson enlisted in the National Guard, but World War I ended before he could be deployed. Then, like two other Missouri modernists, T.S. Eliot and Marianne Moore, Thomson headed east for college, enrolling at Harvard, where he studied composition while also continuing to work as an organist and choir director. At the same time, a young English instructor named S. Foster Damon, who would become an influential Blake scholar, introduced Thomson to the poetry of Gertrude Stein and the music of Erik Satie. Thomson discovered himself in the whimsically deadpan sensibilities of these two artists, and in 1921 he traveled to Paris to begin studying at the American Conservatory at Fontainebleau with the legendary teacher Nadia Boulanger, whose students also included Aaron Copland and Elliott Carter. After returning to Harvard to complete his degree, he moved back to Paris, where he would meet not only Stein and Satie but Jean Cocteau, James Joyce and Pablo Picasso. “Like Harvard men” was Thomson’s way of describing how he and Stein got along, and on January 1, 1927, he played and sang for her his setting of “Susie Asado.” By June, Stein had completed her libretto to Four Saints in Three Acts, and Thomson spent the next year or more setting the text (every word of it, including the stage directions) to melodies influenced by American hymns and spirituals. Four Saints in Three Acts feels like a happy marriage of Dadaism and Andrew Wyeth: the opera premiered in 1934 at the Wadsworth Atheneum in Hartford, Connecticut, with an African-American cast and a set constructed of cellophane, and after selling out its two-week run, it moved to Broadway. Thomson would be famous for the rest of his long life, as both a composer and critic. In 1940, he took an apartment in the Chelsea Hotel in New York, and, though he relinquished his position at the Tribune in 1954, he continued to write for a number of other venues, most regularly The New York Review of Books. 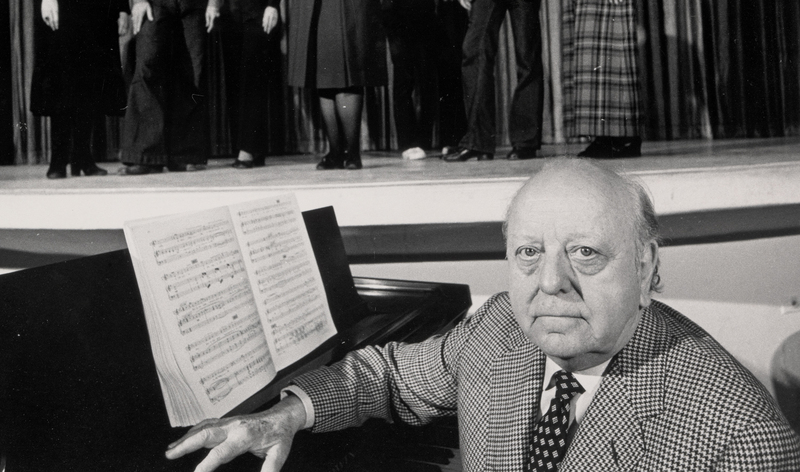 Thomson had little time for opinionated patrons, flamboyant conductors or fatuously crowd-pleasing repertoire, and yet the financial health of musical institutions often rides on the rails of such patrons, conductors, repertoire. The problem (to extend Thomson’s bullfighting metaphor) is that music requires not only a bull, a toreador and a discerning observer who cries “Olé!”; it also requires an arena full of people who buy tickets. Once, when James Joyce was imagining a lucrative career in the theater, his friend Ezra Pound cautioned that there had to be something fundamentally intractable about an art form that requires a thousand people huddled in the dark, night after night, to pay the bills. The remark seems both astute and impatient, and Thomson the reviewer often finds himself similarly caught in a place where his innate Midwestern populism rubs against his equally unaffected Parisian modernism, despite the convincing marriage of these qualities in his own music. The closer the performing conditions for Sebastian Bach’s concerted music are approximated to those of early eighteenth-century provincial Germany the more the music sounds like twentieth-century American swing. The exactitude with which a minimum time unit is kept unaltered at all times, the persistence of this unit as one of exactly measured length rather than of pulsation, the omnipresence of the harpsichord’s ping, like a brush on a cymbal, the constant employment of wiggly counterpoint and staccato bass, all make it a matter of preference between anachronisms whether one puts it that Bach has gone to town or that some of the more scholarly jitterbugs of the town have wandered into a church. This passage suggests that the most important unit of composition for Thomson the writer is not so much the sentence as the paragraph. Such passages have a structural integrity that makes their conclusions feel simultaneously inevitable and unpredictable; their arguments feel like they’re being formulated in the time it takes to read them, as the syntax unfolds on the page. Thomson describes musical form not as a static thing but as a “progress,” something that asserts its integrity over time, and his paragraphs feel similarly crafted as temporal events. People don’t listen to songs they love over and over again because they can’t remember the tune or the words; they crave the temporal experience of hearing again what they already know by heart. Thomson’s finest paragraphs solicit that kind of attention. The world situation of music has altered in every detail, and in most cases there has been a loss of distinction. Even the audience, though much larger and, in the provinces, better informed than it was, is less subtle, less intelligent, less sure of itself. As for Sunday articles, they are written nowadays by people like me. In the early years of this century the critical fraternity contained Ernest Newman, a better historian, and Claude Debussy, a better composer. The later Tribune reviews do offer a detailed chronicle of musical life in New York City: the concerts, the operas, the pianists, the singers, week by week, day by day. And even if this chronicle was not written by Debussy, whom no one disparages for not being Mozart, it was the work of a practicing composer, and one who was capable of describing the most erudite aspects of musical literacy (to borrow the words of another Missouri modernist) in words that cats and dogs can understand. “Straightforwardness on the concert platform is something rarely encountered except on the part of children and of the very greatest artists,” Thomson said of the soprano Kirsten Flagstad, and straightforwardness is the quality that distinguishes his real achievement in both criticism and music. Children lose the power of straightforwardness once they learn to feel embarrassed, and the delight of Thomson’s setting for “Susie Asado” turns on its unembarrassed embrace of a simplicity that might, in other hands, seem knowingly strategic. It has valued, in consequence, quietude, precision, acuteness of auditory observation, gentleness, sincerity and directness of statement. Persons who admire these qualities in private life are not infrequently embarrassed when they encounter them in public places. It is this embarrassment that gives to all French music, and to the work of Satie and his neophytes in particular, an air of superficiality. In both his music and his prose, Thomson was willing to seem as if he ought to be embarrassed. He describes Satie’s sensibility first in its own right, then as an emblem of a national character, but Thomson’s matter-of-fact prose ultimately makes that sensibility, easily mistaken for superficiality, feel like a universal benchmark: Whether listening to music or reading prose, who wouldn’t choose gentleness, sincerity, and directness over the heroic and the oratorical? Thomson could no more associate a particular style with musical greatness than he could with the modern spirit. “Music does not deal in general ideas or morality or salvation,” he opined. “It is an art. It expresses private sentiments through skill and sincerity, both of which last are a privilege, a duty, indeed, of the private citizen, and no monopoly of the prophetically inclined.” The opportunity to read such sentences feels like a privilege as well.